Is It Worth Buying a Meat Thermometer? Home > Cooking & Eating > Is It Worth Buying a Meat Thermometer? As trends in cooking change, so too do the tools we use. Meat thermometers have been a popular cooking tool for many years, but they have recently enjoyed a boost in popularity thanks to experimental chefs finding new uses. Meat thermometers are very easy to come by - most supermarkets stock them, as do kitchen and gadget shops. If you are looking for a basic model, you can find one for less than ten pounds. If you are planning to perform some very exact, technical roasting than you may want to invest in a digital model, which you can find from upwards of twenty pounds. What Does a Meat Thermometer Do? The purpose of a meat thermometer is to allow the chef to know the exact temperature of the meat they are cooking. Traditionally, they are used for roasting poultry and pork. Unlike beef or lamb, poultry and pork need to be properly cooked to ensure all bacteria are killed off. Undercooked poultry and pork can give food poisoning to even the healthiest people and can be terribly harmful to pregnant women and those with a reduced immune system. Using a meat thermometer is the safest way to ensure that poultry and pork is properly cooked, although current restaurant trends are leaning towards serving pork slightly pink, as they do in France. However, this is not to many people's taste and is not really suitable for pregnant women or the elderly, according to the Food Standards Agency. To check if your meat is properly cooked, you need to insert the probe of the meat thermometer into the thickest part of the meat. The best way to do this is to test two different areas. First, test the thigh meat - go right into the widest part of the thigh - wait a few seconds for an accurate reading and check the temperature. The correct temperature for properly cooked thigh meat is 180 degrees Fahrenheit. If the meat thermometer reads lower, you need to put the bird back into the oven. Do not make the mistake of leaving the oven door open while you test the meat as, if you need to return the bird for a few more minutes, the temperature will have dropped in the oven and you will need to adjust your cooking times, which can result in tough meat. The second place to check is the breast of the poultry. Again, insert the probe directly into the thickest part and wait a few seconds. Here, you are looking for a reading of 170 degrees Fahrenheit to ensure the bird is properly cooked and all bacteria are killed. For testing pork, test the thickest part of the meat in the same manner, checking in two parts if the joint is long. You need to achieve a temperature of 165 degrees Fahrenheit for pork that is totally cooked through. Do not cut the joint to check if it is cooked instead of using a meat thermometer as you will loose the important juices of the meat and it will be tough. In recent years, experimental chefs such as Heston Blumenthal and Gordon Ramsay have introduced the home chef to new techniques for roasting meat. 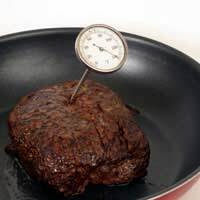 Ideas such as cooking a joint of beef for twenty hours at fifty degrees gives a succulent, perfectly tender roast, but it is impossible to create without a meat thermometer. If you enjoy experimental cooking and would like to try long, slow cooked meat, a digital meat thermometer will give you restaurant results at home.